The Manfrotto 503HDV,351MVB2K tripod and fluid head kit is the perfect complement to the new HDV cameras hitting the market. The tripod kit features tandem leg sections and a 75mm bowl, topped with a smooth pro fluid video head. Simplicity and strength are the two main features of the 1-stage aluminum alloy 351MVB tripod. One stage means longer leg tubes with fewer joints, and therefore a more rigid support which also requires less time to erect. The 503 HDV head was designed for payloads up to an ample 17.8 lbs, and the light but positive fluid movement provides exceptionally smooth control. The Bogen/Manfrotto MBAG90P Padded Tripod Bag is a padded tripod bag designed to carry Bogen/Manfrotto tripods with head up to 35" long. Thermoform padding holds the tripod in place and protects it, especially the head, during transport. 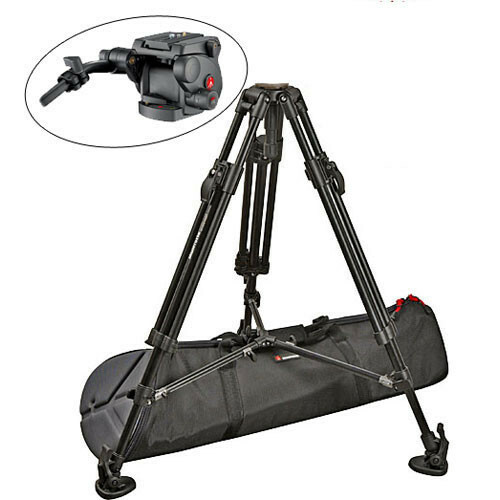 503HDV,351MVB2K Aluminum Video Tripod Kit is rated 4.4 out of 5 by 50. Rated 3 out of 5 by Anonymous from Not as smooth as hoped I used the tripod with an XH-A1 and an HC3. I found the tripod very nicely crafted, but very heavy, clunky to move, and not very smooth. I spent a lot of time trying to get pan and tilts smooth, and didn't ever get there. Compound pans and tilts were very jerky, tended to stair step. My first unit had a defective leg, had to return it. The 2nd unit was less smooth than the first. I found I got better results from my Sony 870 (rebadged Velbon 607) although I really did like the 75mm bowl and the professional look of the black and machined aluminum. This was my first expensive tripod and I was very disappointed. Rated 5 out of 5 by Chris from Great product for the price I use this tripod for everyday use with an HVX200 and a Canon XHA1. I shoot both in studio and our in the feild covering sporting events and commercial production. This tripod is super stable and easy to deploy. The head is butter smooth and gives me confidence in every tilt/pan move I do. The only negative is it can get heavy after a long carry all day. But again for the price I am totally satisfied. Would highly recommend to anyone looking for a solid and smooth tripod on a budget. Rated 5 out of 5 by Anonymous from Does the job This is a heavy tripod but allows for easily fluid movement with a pretty low learning curve. Obviously my HMC150 is not that heavy, so I cannot comment as to performance with heavy cameras, but for mine it works well and provides that sturdiness you demand. It isn't that easily adjusted at times, but if you are patient you can get the job done in a semi-hurry. I love the quick release and use it a lot. I haven't figured out the feet yet but nor have I needed them, but I will soon. The case is nice even if it's a bit of a tight fit. Not much else to say except get this if you cannot afford the next level up. Rated 4 out of 5 by Shawn L from Most comfortable tripod I've ever used. The stability, versitility, smooth operation and comfort are a joy to use. I have complete control, and all of which is easy to adjust. Everything turns, extends and contracts ultra smoothly. And its a very strong piece. It has no problem handling my EX1 with a Letus Extreme and lenses attached. The rail support system also fits right in with the tripod head. The best choice I've made in quite some time. The only con is the weight. It's a bit heavy, but it needs to be for such stability. When its in its case, and on your shoulder, it doesn't seem nearly as heavy. Comes with a good case. Rated 4 out of 5 by Anonymous from Good middle-of-the-road tripod It is light, well designed, and works great with the Sony EX1. No problems with it and it comes with a air travel-friendly case. Solid choice. Only drawback is the pan friction control is in a rather odd location right under the head. Rated 5 out of 5 by Anonymous from Nice Kit! Generally I steer away from buying kits because they're filled with a bunch of cheap accessories that you don't need/wouldn't buy separately. However, the bag that comes with this tripod kit is really high quality and comfortable to carry! The legs are a bit heavy, but they're super sturdy and adjustable. The 503 head is smooth and solid. I use this kit with a Canon XHA1s and it could handle much more. I work in an office where I'm the only media person but others who walk by constantly say how high quality the tripod looks - and I'd have to agree! Good buy!